This Nativity scene lacks the traditional donkey and ox but in stead the artist has chosen to give a role to the horses of the three Wise Men from the East. On the right the grey horse with the blue saddle attracts attention. Behind this one the two other horses are visible. On the left a grey horse pushes its head against a man in a blue jacket. 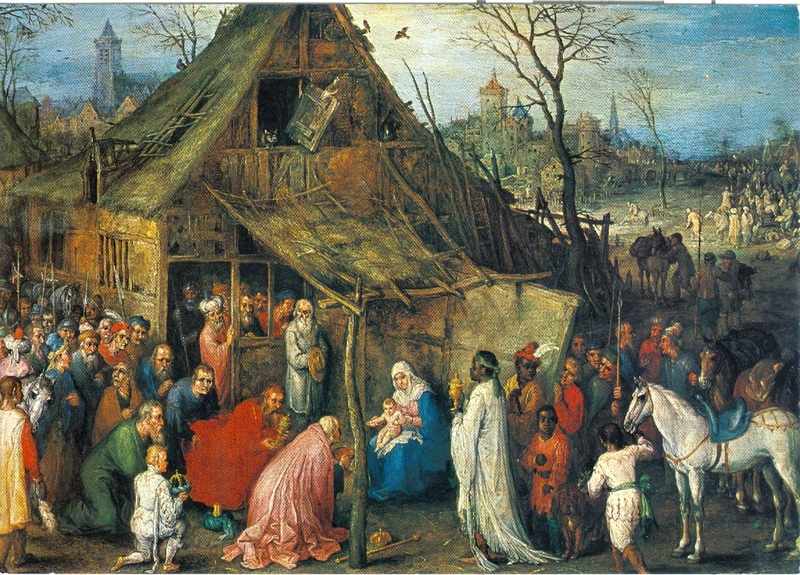 Of course the main subject is Maria showing her Child Jezus to the Magi and the many other spectators. Yet the grey horse is an important part of the painting and the artist rendered with care the saddle, the breast plate, the crupper, the bridle and the stirrup leathers, which all are made of the same gold-colored material. The blue saddle with high pommel and cantle could well represent a saddle from the Near East. The horse does not have Oriental looks and may be the portrait of a horse he knew in his own environment. The artist was, however, not an expert in painting horses. The pasterns of the four legs are far too much bent through. Between the grooms of the Magi also a dog is sitting, which shows the type of the bloodhound and could be the portrait of familiar dog.